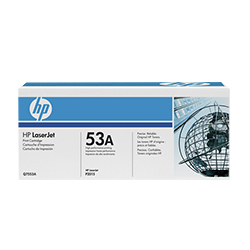 HP LJ P2015 Black Toner Cart., 3K (Q7553A) : Disk-O-Tape, Inc.
Stay productive—the Q7553A LaserJet toner cartridge from HP deliver consistent performance and professional results. Page yield (black and white) Average cartridge yields 3000 standard pages. Declared yield value in accordance with ISO/IEC 19752.